Wausau Window and Wall Systems significantly expands its 3-D building information modeling (BIM) tools with the addition of a new unitized curtainwall Revit® project file. This single file is pre-loaded with Wausau's INvision™ family of unitized curtainwall profiles allowing architects, designers, engineers and contractors to easily choose different widths, depths and sightlines. This all-in-one approach automatically updates to the selected parameters without repeating steps or requiring multiple files. "Our all-inclusive approach saves time by making the whole process much more simple for the user to explore multiple options and determine the right conceptual fit without needing to open, create and recreate multiple files," explains Jerry Habeck, Wausau's product standards manager. "You can change the curtainwall model on the fly to see how our curtainwall looks on your building design, and then change it again as you choose." Steve Carrico, Wausau's design engineer, elaborates, "Because it's all very visual, building owners and team members also can use our Revit files in conjunction with other BIM tools for clash detection. This not only can help save headaches, but can save money by identifying potential conflicts on the drawing board before anything is fabricated and shipped to the field." 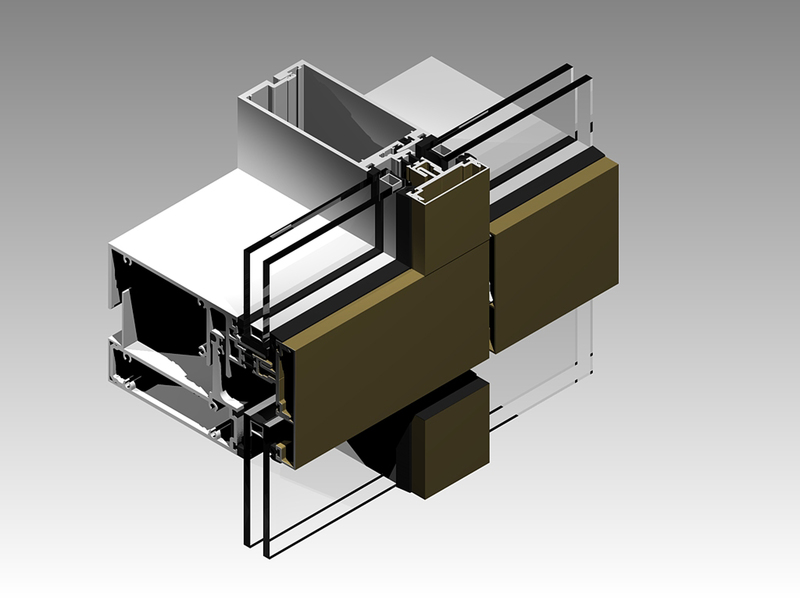 Carrico adds, "Clash detection functionality can be especially useful in design of hospital patient room plenum areas, which contain curtainwall anchor assemblies, spandrel beams, fire safing, and dampered return ducts, as well as medical gas and communications lines – all competing for the same physical space." Projects of high geometric complexity are also prime targets for the application of BIM tools. On California's award-winning Anaheim Regional Transportation Intermodal Center (ARTIC), the architect, HOK's Kazem Toossi noted, "BIM was an important tool to set out the compound curve on east and west walls where Wausau's window walls and metal panels were utilized. These elements were supported off of the supplemental steel framing from the building structure." The SmartMarket Brief's research report also revealed that the building envelope is amongst "the greatest areas of unmet demand" for building modeling tools. Wausau's Habeck and Carrico agree. They found few examples across the industry and much room for improvement. "We really wanted to deliver the most user-friendly, best-in-class 3-D model we could. And I think we succeeded," says Habeck. All Wausau Revit files were developed in compliance with the requirements for design intent models included in the American Architectural Manufacturers Association's (AAMA) 913-14 Voluntary Specification for Non-Residential Fenestration Building Information Modeling (BIM). Unitized curtainwall systems like INvision are factory-assembled and-glazed under controlled conditions before shipment to the job site. Only one unit-to-unit splice (usually a silicone sheet or patch) needs to be field-sealed, and only one anchor per mullion needs to be attached to the face or top of the floor slab. These features minimize dependence on scarce and expensive field labor. 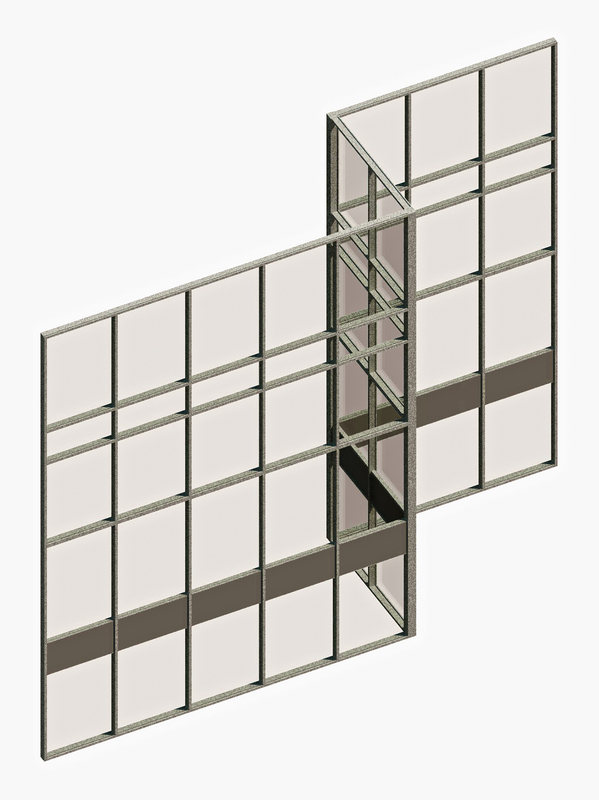 Interlocking unitized curtainwall frame members are weather-stripped to seal to one another, both horizontally and vertically, accommodating building movements. Revit files for Wausau's INvision unitized curtainwall, conventional stick SuperWall™, and the INvent™ family of projected and fixed windows are available in the detailed product pages of its website. For example, visitors can click on Curtainwall from the home page, and then choose "View More" for any of the curtainwall products shown. In the horizontal menu at the bottom of the product page, click "Revit." The relevant files are compressed as a .zip folder that may be clicked for immediate download, or may be added to the visitor's download cart to conveniently share and send multiple documents.